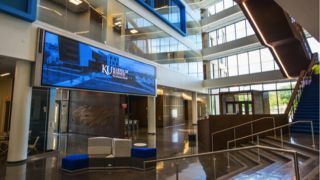 When The University of Kansas (KU) began designing its new $70.5-million Capitol Federal Hall School of Business, everyone agreed that the end result had to be a building that fostered a new and higher level of collaboration between faculty, students, and visitors. The building design called for large open spaces and interconnected common areas that, by design, promoted a greater level of serendipitous interaction between all building visitors. At the same time, the administrative, architectural and design teams also agreed that the building needed an anchor, a focal point that would immediately draw everyone’s attention. That focal point turned out to be the building’s main atrium with a strategically placed coffee bar — a coffee bar anchored by two brilliant NanoLumens NanoSlim Engage LED displays. The building project began with The University of Kansas issuing a request for qualifications to local architect and design firms. Gensler, the world’s leading collaborative design firm, andGastingerWalker&, a full-service architecture firm known for being enthusiastic about the process of design, jointly filed the winning proposal. “The building was designed to foster creativity and interaction,” GastingerWalker& Partner Dan Nenonen explained. “There are all sorts of interior spaces where students, faculty, visitors, and donors, can literally bump into each other; all of the interaction starts at the coffee bar in the main atrium across from where the NanoLumens NanoSlim Engage LED displays are positioned.”According to David Broz, Principal at Gensler, “Louis Pasteur’s quote, ‘Chance favors the prepared mind,’ served as an inspiration to the design team who operated under the belief that serendipity could not only be encouraged, it could be manufactured. The team designed flexible interior spaces that offer cues to people using them, and motivate people to connect in new ways. The design engages students by inviting authorship and offering students choice and control over where and how they learn – including the video board." Rossborough added, “Once the idea of large format displays was added to the design plan, The Sextant Group knew that they needed a fine-pitch display solution that was big, making it a focal point in the building.” Once The Sextant Group showed the NanoLumens technology to the design team and school administrators —the ultimate project decision makers— the choice was clear. The Kansas City-based integration company SKC Communications was selected to install the entire building’s technology, including the NanoLumens solution. “From our perspective, what stood out the most on this project was the NanoLumens overall design concept for their walls, which translated into a simple implementation,” SKC Communications Director of Marketing Lacy Fox stated. The NanoSlim Engage solutions play a critical role in providing daily business school, university, and national news updates for students, faculty and visitors. The displays are also used for special events hosted by the School of Business during the year.